After years of trimming my trees and witnessing mountains of woody debris being collected and hauled off to the landfill, I was thrilled to discover that an outgrowth of Plano’s new program was the conversion of the collected debris into soil amendment products such as humus, mulch and compost. The city was marketing those products to consumers as a revenue stream! This was the most realistic example of closed loop thinking I had ever encountered. Soon afterward, Nancy made me aware that they were also crushing collected glass and selling it as billet to local glass product manufacturers. Novel thinking and committed action! In that moment the concept of thinking globally and acting locally became clear. Nancy's team built a small backyard composting demonstration garden that grew in popularity with volunteers and residents, eventually evolving into the Environmental Discovery Center. A typical Saturday featured hands-on master gardener classes, master composting, water conservation, xeriscape landscaping, beneficial insects identification, organic pest control and recycling classes outdoors. As a consequence of their passion, City Council ultimately tasked Nancy’s department with educating the community on sustainability and incorporating sustainable best practices into city government, local businesses and the daily lives of its residents. The mission and the vision just got bigger! The focus of the educational effort was expanded to include energy conservation, air quality, water conservation, native planting materials, pest control, etc. 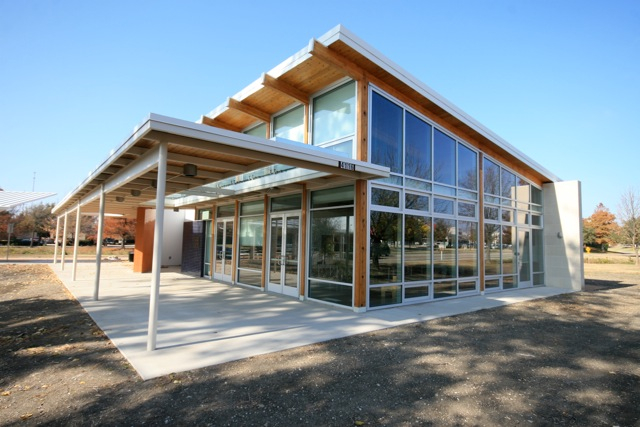 The finished facility – the LEED Platinum Plano Enivronmental Education Center - displays dynamically how to integrate sustainable features and actions into the homes and businesses of the community’s residents. It’s not surprising that one of the most popular aspects of the building is that all of the stormwater runoff is contained on site. Our region is reeling from the effects of extreme summer heat, extended drought conditions and current municipal water restrictions. Residents are delighted to learn that 25,000 gals of rainwater are harvested from every square inch of the roof and shade canopies and recycled first as flush water for the toilets, then to irrigate the living roof and finally to water the native demonstration landscape that envelopes the facility. 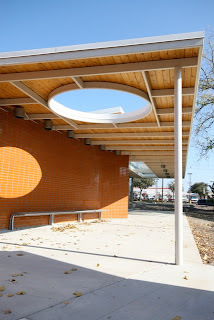 Every aspect of this facility was designed as an educational tool to highlight and celebrate sustainable features with a simplicity and friendly practicality that informs the cities’ diverse multicultural residents that environmentally responsible actions are not difficult to implement and are easy to do. Plano’s local leadership with this green building is already having an influence on economic and environmental actions by citizens and businesses alike to save energy, create jobs, and restore the local environment.